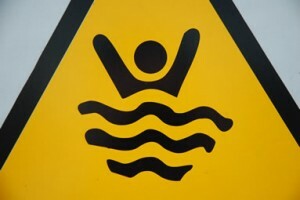 In this first aid blog post we discuss the different types of drowning which can occur. So what are the different types of drowning? Drowning can be categorised into five different types: near drowning, dry drowning, freshwater drowning, salt water drowning and secondary drowning. Near drowning is when the patient is rescued before the point of death or there is temporary survival. When a drowning person sinks and becomes more deeply unconscious the stimulus to breath is still present. As they try to breathe, water enters the pharynx stimulating the reflex that closes the larynx and epiglottis and thus diverting water to the stomach. With the airway sealed the patient suffocates. Approximately ten per cent of drownings are dry drownings where water has not entered the lungs. When external respiration (exchange of gases in the lungs) is interfered with by freshwater entering the lungs, the body will absorb the water into the blood. This haemodilution distorts the pH value of the blood [normal blood pH is 7.4 on a scale of 1 to 14, 1 being most acidic and 14 being most alkaline, 7 is neutral]. The body can cope with, and rectify, small changes in pH but larger changes associated with significant haemodilution may result in cardiac arrest occurring, sometimes within two to four minutes of rescue. Salt water has the opposite effect of fresh water with water being drawn from the blood into the lungs.With the viscosity of the blood increased the circulation becomes sluggish, slowing the heart rate until the point of cardiac arrest. Cardiac arrest may occur up to 12 minutes after rescue. Where a victim of drowning is successfully rescued and resuscitated they may appear to be fully recovered but could still die. If water has entered the body, rapid absorption from the stomach to the bloodstream will take place, causing haemodilution and distortion of pH balance, which could kill the patient up to 72 hours later. If the patient drowned in salt water, residual water in the lungs can draw fluid from the bloodstream causing pulmonary oedema or ‘shocked lung syndrome’ which may occur may hours after the event.